As Valentine’s Day approaches, lovebirds will line up for chocolate-covered strawberries at Ruthie Carliner’s evocatively named Velvet Chocolatier shop in Stevenson Village. Her chocolates can also be found at Whole Foods, and Oprah included her creamy sea salt-topped caramel cups in her list of “favorite things” back in 2011. But Carliner’s calling in creating decadent desserts is a far cry from her original career path. As a young wife and mother, Carliner, a CPA with a master’s degree in taxation, worked for her father, Stanley Penn, owner of Penn Pontiac GMC Truck. truck dealer on the East Coast. But when the economy took a nosedive in 2007, a “stressed out” Carliner decided it was time to move on. The only problem? She had no idea what to do — until a class on chocolate turned her life around. Carliner, who lives in Owings Mills, began refining her chocolate-making skills at home, first learning about the different types of chocolate and different customer preferences. American chocolate, for example, includes added sugar, she explained. European chocolate makers generally use less sweetener, and prefer using honey. After much trial and error, Carliner developed a product she thought would appeal to customers, and began “peddling” her candy from store to store. Foods’ national distributor. That, in turn, led to Carliner’s chocolates being noticed by Oprah Winfrey. “That put us on the map, and opened us up to all sorts of possibilities,” said Carliner. The Velvet Chocolatier’s moniker was suggested by one of Carliner’s best friends, and the theme is carried out through the brown velvet ribbon that adorns every box of chocolates. 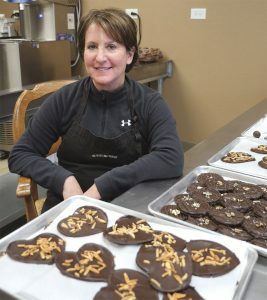 Carliner prides herself on the fact that her handmade chocolates are gluten-free, kosher, contain no liqueurs or other additives, and are as sweetener-free as possible. The only time she uses added sweetenings are for her ganaches (fillings made from chocolate and cream), caramels and toffee. Enthusiastic young college students, like Sarah Hewitt, help Carliner turn out such specialties as cashew chews, sea salt chocolate caramel cups, barks, truffles, chocolate-dipped potato chips, and her latest creation, chocolate “spoons.” Hewitt, Carliner’s longest-working staff member, became a part-time employee as a college freshman and is now a graduate student in psychology at the University of Baltimore. “I want to grow the business so Sarah will stay!” Carliner said. For Hewitt’s part, what began as a way to earn some money in college has turned into a true passion. The two often work side by side. Enter the shop, and you’ll see them clad in gloves and aprons, busy toasting nuts, tempering the rich Guittard chocolate, hand-dipping truffles, or hand-painting the caramel cup paper holders with melted chocolate. And yes, if you’re wondering, Carliner and Hewitt do eat some chocolate every day. And no, they don’t get sick of it, nor do they get fat. While Carliner and Hewitt are partial to cashew chews, the toffee bark and caramel cups are the best-sellers. clients worldwide, and an online store at theveltchveocolatier.com. Her chocolates are also available at Graul’s Markets, the Wine Source in Hampden, and French Paradox Wines in Stevenson Village. Last year, the Velvet Chocolatier was named “Baltimore’s Best Chocolate Shop,” by Baltimore Magazine. Because of Carliner’s family responsibilities and Hewitt’s class schedule, the shop has somewhat unconventional hours: Sundays from 10 a.m. to 3 p.m.; Wednesdays from 9 a.m. to 2 p.m.; Thursdays from 4 to 7 p.m.; Fridays from 9 a.m. to 3:30 p.m. (“or whenever the light is on”).